A noted Atlanta historian and professor of American studies, Dana White served Emory for nearly 50 years as a teacher, scholar, administrator and library curator. 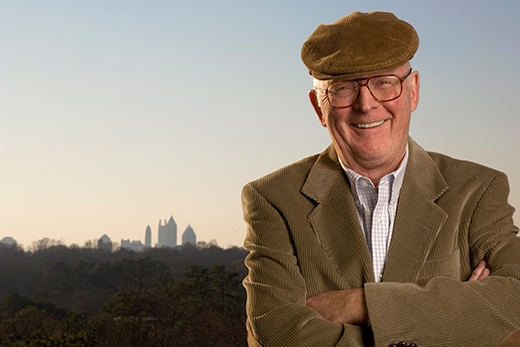 Longtime Emory educator and acclaimed Atlanta historian Dana F. White, Goodrich C. White Professor Emeritus in Emory’s Institute for the Liberal Arts (ILA), died Nov. 24 following a pedestrian-automobile accident. An urban historian and professor of American studies, White, 82, had worked at Emory for nearly 50 years as a teacher, scholar and administrator. Though he retired from the classroom in 2011, he served an ongoing role as consulting curator with Emory’s Stuart A. Rose Manuscript, Archives and Rare Book Library. Much of his scholarship focused on Atlanta’s cultural and civic evolution throughout the 20th century. White was widely known for his work as co-creator — along with fellow urban historian Tim Crimmins — of the award-winning eight-part documentary series “The Making of Modern Atlanta,” which examined the city from 1940 to 1990. White is remembered by colleagues as a caring and influential teacher and mentor, an impassioned interdisciplinary scholar, and for his steadfast service to the university. “He was a tremendous presence in our community, even after his retirement as a member of the faculty, and we will miss him,” Elliott says. Born in New York City on Nov. 18, 1934, White attended Fordham Prep and Fordham University, where he earned his bachelor's degree in 1956. He earned a master's degree in American studies from the University of Wyoming, and after serving in the U.S. Army, received a doctorate from George Washington University in 1970. He taught urban history at the State University of New York at Buffalo and served as a fellow at the Smithsonian Institution before moving to Atlanta in 1970 to teach jointly at Emory University and the Atlanta University Center. In time, White would become recognized as a leading authority on Atlanta history. He wrote extensively about the city and often used it as a laboratory for his graduate and undergraduate courses and scholarship. While at Emory, White twice served as director of Emory’s Graduate Institute of the Liberal Arts — today’s ILA. At the time of his death, he was working with Emory film historian Matthew H. Bernstein on the history of movie culture and cinema in segregated Atlanta. “Dana was an extraordinarily unique person,” says Bernstein, Goodrich C. White Professor of Film and Media Studies and chair of the Department of Film and Media Studies. Joining White on several occasions to co-teach a course based upon their research, Bernstein says he was “always struck by his concern with how students were doing with the material and how they were doing personally. “Dana wanted to know their stories and their struggles. And he was always very generous with them, very understanding,” Bernstein says. In pursuit of his scholarship, White developed a longstanding relationship with the Rose Library, where he indulged research interests in the growth and development of Atlanta, civil rights history and sports. Once retired from the classroom, White sought to remain involved with the library. As consulting faculty curator, he worked closely with the acquisition of materials and helped envision exhibitions and programs, says Rose Library Director Rosemary Magee, who first worked with White when she was a graduate student at Emory. “Dana helped us understand that Atlanta has a deep, rich and diverse history, that there were stories behind every neighborhood, every gathering,” Magee notes. “He brought those stories to a new level of visibility to us, which is the mission of the archive — to take historic documents and moments and give them meaning and texture in our lives. Following private family services this week, a celebration of White’s life will be scheduled on the Emory campus later this semester. Donations in his memory may be made to the Dana Francis White Fund, Rose Library, Emory University, Atlanta, GA 30322; or the Initiative for Affordable Housing, PO Box 855, Scottdale, GA 30079.